In May 2015 my Samsung NX 12-24mm f/4.0-5.6 (EX-W1224ANB) broke completely in half simply when I attached the supplied lens hood to the lens. The lens was not dropped, knocked or mistreated in any way. I have since looked at the lens construction more closely and am absolutely stunned how badly designed and engineered it is. The mount is attached to the lens by three extremely short screws, just 1.5 mm in diameter and 4.4 mm long. These each pass through tiny plastic cylinders that project from the rear lens element mount. Crucially however, the short length of the screws does not permit them to transfer the load to the main body of the lens, ending as they do just beyond the plastic cylinders. How Samsung engineers expect such a flimsy and weak plastic material to bear the rotational shearing forces is beyond me. It was a failure just waiting to happen. 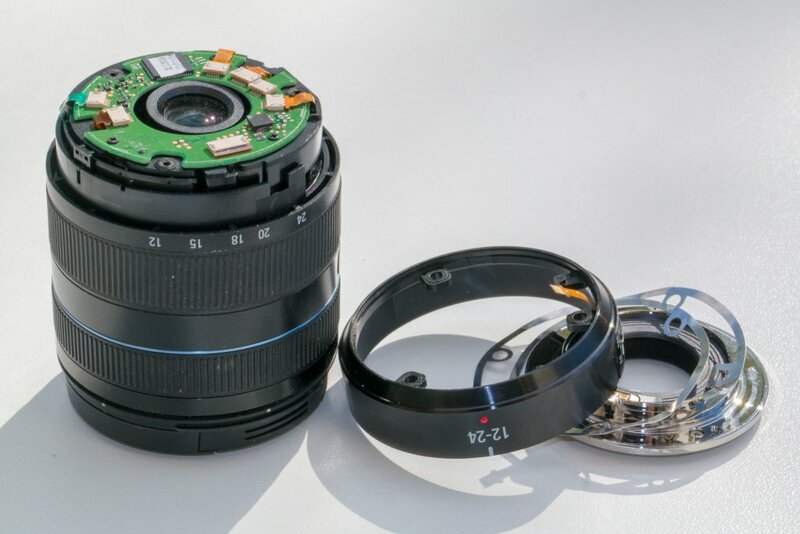 It would seem I am not alone with this experience, with several postings here and around the internet of unhappy users of the lens incurring the same problem. So aghast was I at my experience, I returned the lens to Mr Sunny Lee, President & CEO Samsung Electronics at Samsung’s European Headquarters in Chertsey, Surrey, England. I believed he should be aware of the issue and that even though my lens was now well out of guarantee, that Samsung should repair it at no cost to me, as clearly the lens was poorly designed and not fit for purpose. I had expected that Samsung’s response would be immediate and apologetic. Alas, this was not the case. Two weeks after the lens was delivered to them I received a terse and unambiguous refusal to accept responsibility and to stand behind their products and repair or replace the lens. So, given Samsung’s utter failure to accept any responsibility in this matter and their readiness to snub their noses at a customer prepared to buy into their NX system vision, I believe it’s time to use social media to call Samsung out for what they are and to alert other potential buyers of their NX system of the fact that (a) their design and engineering skills are not what you might think, and (b) they refuse to stand behind customers who spend significant money on what they think is a viable alternative to Nikon and Canon. I have created a simple Facebook page, 'Samsung's 12-24mm' to promote this issue to a wider audience. It can be seen at https://www.facebook.com/samsung1224mm .